This is a wedding cake Caitlin and I made for Nat's wedding. We had allot of fun making the cake, however it was very stressful getting the cake 65 miles south to the reception. All went well and the cake was "delich". Monday, Memorial Day was spent quietly watching Band of Brothers with Eric and Nate. Picture at right is Eric's reflection on the Vietnam memorial in Washington D.C. He was in Vietnam from late 1969 to 1971. I am so proud of him and grateful that he survived and came home. His mother told me she would mark off everyday on the calendar until he returned to the states. I can not even imagine. I did run over to My Sister Knits and picked up some yarn to make a rug at a wonderful sale, 75% off. Thank you Julie!!!! I love making rugs! Eric and I then took Nate to DIA for him to return to Chicago after a week end visit with all of Eric's family. Had a wonderful BBQ in Audlt. The drive to Denver was easy, the return trip we stopped at my quilter's, she was not home so left the quilt (Santa's) on the porch, hope she gets it. Half way back home the rain started and boy did it come down. I dislike driving in bad weather, but to home we returned safely. It has been a strange spring here in Colorado! wants nothing to do with kitchen, Erin use to be my crafting partner but now she is into school, work,outdoors,and just plan hanging out. Yesterday about lunch time a HUGE tornado ripped through the town of Windsor. This town is just down the road from me. Half the town is gone, just gone! I have no idea if any of the people I work with at the hospital who live in Windsor lost their homes, except for Kaye, her house escaped untouched, thank you Lord. Will call into work later and see what needs to be done. Nathan is flying home today, Eric is in Denver and will pick him up. We will be celebrating the life's of Bettie and Don this week-end out in Audlt. The entire "famdamly" is flying in for the celebration. Caitlin and I will be baking the desserts for the occasions. Hope to have lots of pictures for the blog and scrap book. Today is beautiful outside!! I woke up to misty rain, and fogginess through the thick green trees, almost feels a little like being in the English countryside,( on a high plain dessert). The rose table topper I made to cover a table that shows dust immediately post dusting, it's cherry wood. 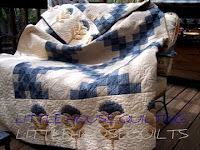 The pastel quilt on the love seat is an idea I saw up in at Snowy River Quilt store in Laramie,Wy. 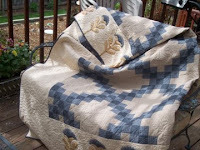 I did not buy the quilt just allot of half yard cuts of fabric Eric and I picked out. Scary I am letting Eric help me pick out fabric, a first but we did really well together. Sometimes that man surprises me.Anyways I made two of these quilts one for me and one for a niece, which one I do not know. I never decide who they are going to till they are completely done. Tuesday evening Kathleen and I finished piecing our Santa quilt from Buggy Barn and hopefully these will go to the quilter in Denver on Monday. I am at the oral surgeon's office and a nurse came out and said she remembers me working nights with her in 1980 on 3rd north . What a flash back, good to see her. I am at the office with my daughter Caitlin who is getting all four wisdom teeth pulled. Why do they call them wisdom teeth and if they are truly full of wisdom why are we removing things that we all could use more of,WISDOM. One of those life things that just make little sense. Still had the layout I was having trouble with , oh live and learn. My 30's quilt are blocks from Kindred Spirits that we exchanged and this is how I chose to put it all together. 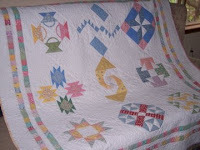 I love this quilt, it is all my good friends quilted together on one quilt top. This quilt adorns my couch in the summer and gets rave reviews from all . After posting I found that I finally had the layout I was looking for, however I do not know how I got to it, pushed to many buttons to fast. What a learning experience, it's like being back in school and at my age, oh my. 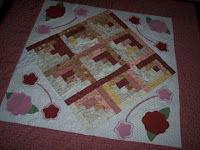 I love this quilt, it is a block exchange from Kinder Spirits quilt group. I used up alot of scraps for the borders. All summer long this quilt will dress the davenport. 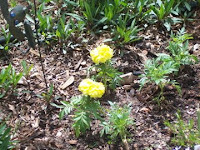 The previous post was several pictures I wanted up on the blog but I could not figure out how to stretch the post so I could write on that post.? 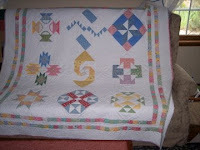 The quilt is an Irish chain I made for DH and myself, with some applique ( from Kim Dahl). I made 15 Irish chains 3 years ago for my family members and am trying to get some quilts done for all my nieces and nephews. 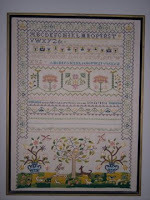 The needle work was done by my mother in law. She claimed that once completing this project she was to wear glasses the rest of her. My MIL is now with the Lord and having her sampler brings wonderful memories of her. 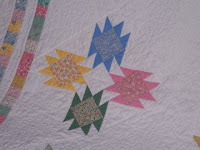 I finished the binding on this quilt while watching "Broken Arrow" with my husband. Not a movie I can reccomend, a little bit to far out there for me. Anyway I have been working on this quilt for about 2 years,( I really need to know how to machine applique and soon). I am very pleased with how this quilt turned out. 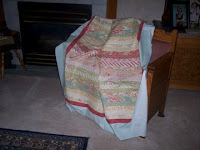 A friend in Denver quilted it for me and it is just lovely, my DH likes it also, always a plus. Today I have tried to resize a picture for Craig's List and can not figure it out, neither can my husband. This is so frustrating to me. 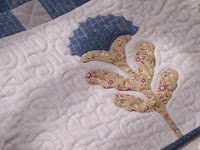 Oh well, I did alot of gardening today, and photographed some quilts. I will be putting this all up on the blog this week. A nice thing about my blog it can be "another" record of the things I do and make. 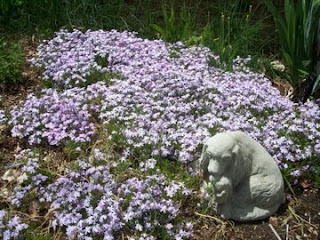 I love phlox and grow allot of it in my front yard. 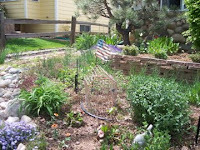 I should put some in the back, it is maintance free, plus prolific. Tomorrow my good friend Kathleen and I are going to try to get some sewing done after work. We are finishing "Santas" by Buggy Barn. We both so enjoy Buggy Barn quilts. My 50th Birthday quilt from Pin Heads quilt group. When you turn 50 the group makes a Crows Feet quilt for you. 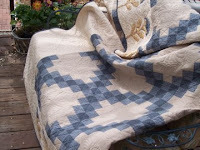 I love scrap quilts !! It is such an honor to recieve this quilt and know these wonderful people. On the back they have appliqued a bird with a nurses hat( I am an RN), it makes me laugh. Silly Maddie, she is a 6-year old Dashound and cute as a button. Here she is caught in her blanket. Today it is very cloudy and rainy, my favorite kind of weather. 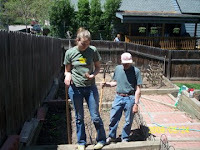 Today I hope to get some more planting done, with some quilting in the afternoon. I have to look at some houses for my sister late afternoon. She and her family are moving here from Chicago. I have not lived near anyone of my many siblings for my entire adult life. Can't wait for their company. She is moving at a perfect time in my life. steep learning curve for me but I am up for the challenge. So here I go into the new world of blogging.